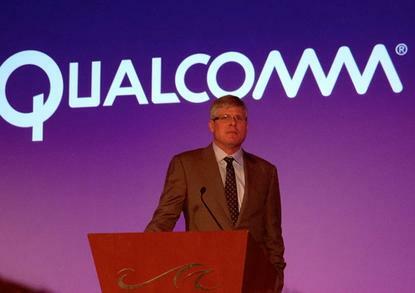 Qualcomm's CEO said his company has the capabilities to build ARM server chips but was careful not to disclose any product plans at the International CES in Las Vegas. "It's an interesting opportunity for us, because the assets you need to develop to be a leader in mobile -- GPUs, CPUs and low-power designs -- set you up for [the server market] as well," Qualcomm CEO Steve Mollenkopf told reporters at CES, when asked for his view on ARM servers. ARM processors are more commonly found in smartphones and tablets, but several vendors, including Hewlett-Packard and Dell, are eyeing their use in servers because of their very low power consumption. ARM chips aren't especially powerful, so they're not being aimed at traditional enterprise applications such as payroll, but they're seen as a good fit for dishing up Web pages and other high-volume online workloads. Advanced Micro Devices and AppliedMicro are among the chip makers developing ARM processors for servers. Calxeda, another contender, closed its doors recently. One analyst said it had peaked before the market was ready. Smartphone and tablet applications are driving more demand for computing in data centers, and Qualcomm could leverage its expertise in low-power computing in the server market, Mollenkopf suggested. But when asked to discuss any server chip plans in detail, he backed away. "To be clear, I didn't mention that we had any announced products for servers, but it is interesting that we have the capability to go into something like that," he said.